On Nov. 8, 2017, student leaders gathered in Texas for the inaugural LeadWorthy Live event - an initiative designed to build a community of remarkable leaders. Hurricane Harvey didn't stop the Houston Astros and it’s not stopping the students of the Gulf Coast region. Five weeks after a Category 4 hurricane flooded Houston, Texas, more than 1,500 student leaders gathered for the inaugural Leadworthy Live event in a venue previously used as a hurricane relief center. On November 8, 2017, Flip Flippen, A.J. Hinch, and other special guests challenged student leaders to live remarkable lives. Students from across Houston gathered in the Berry Center in Cypress, Texas to be inspired to make a lasting difference in their communities. LeadWorthy is the vision of New York Times best-selling author, Flip Flippen and is an initiative designed to challenge students to pursue excellence in their relationships, leadership positions, and future careers with the goal of building a community of remarkable leaders. Fresh off his World Series win, students and educators heard from Astros manager A.J. Hinch and were captivated and inspired by talks from entrepreneurial illusionist, Vinh Giang; LTG (Ret.) Robert VanAntwerp; Guiness Book of World Records Holder Gabi Ury; and Flippen Group founder, Flip Flippen. Student leaders and educators were brought to their feet by exhilarating performances from NBC's The Voice contestant, Courtnie Ramirez; and from the 5th Ward Men of Distinction and Sisters of Distinction stomp teams, founded by Dallas DJ Rock-T. Finally, the students were challenged to #BeRemarkable. 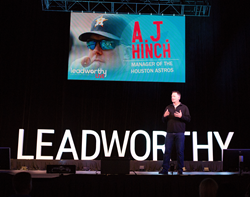 In 2018, LeadWorthy will be hosting live events in Dallas and Houston, Texas.